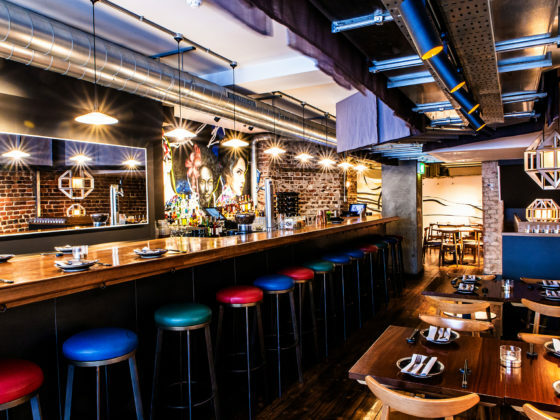 Galvin HOP in Spital Square is an all year round dining bistro / brasserie with a charming al fresco terrace for the warmer months and a cosy, cool restaurant indoors. 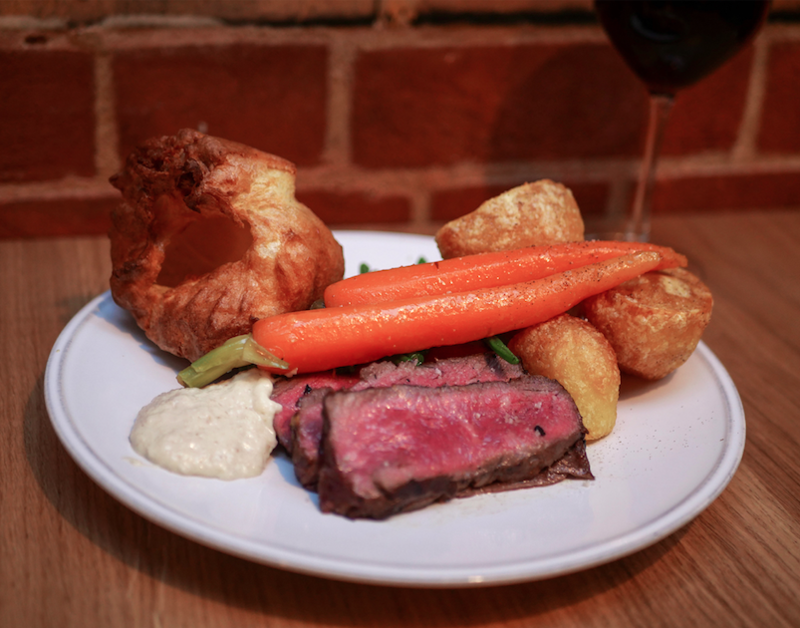 It’s the perfect place to spend a long lazy Sunday supping delicious reds by the glass, or beer from the tank, whilst feasting on the most sumptuous of Sunday roasts. Galvin HOP is adjoined to its fancy older sibling Galvin la Chapelle and what’s really wonderful is the fact that HOP is much less formal, yet you still receive the excellent service which their Michelin star restaurant is renowned for. 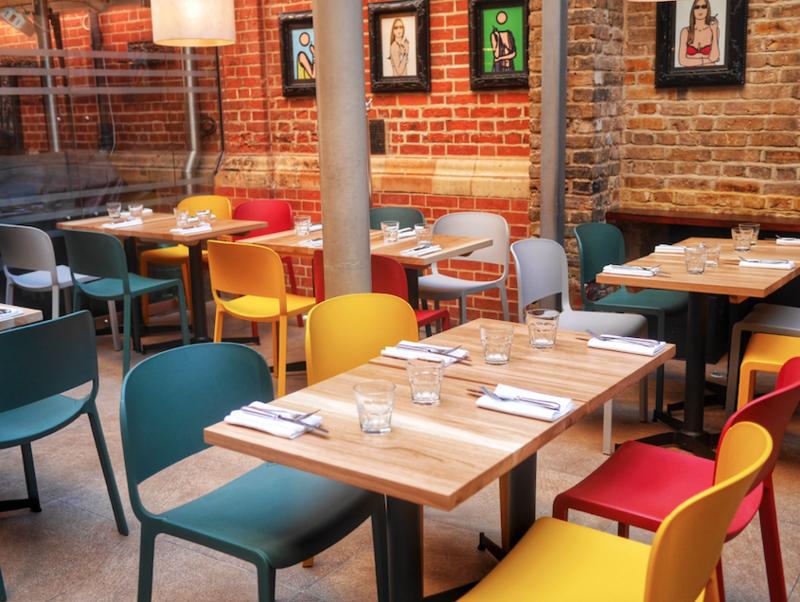 With a modern interior, funky cool colours and mis-matched chairs, the restaurant gives off an urban feel and feels like a laid back gastro where you can while away the hours – basically what Sundays were made for! What’s more kids eat for free so there really is NO excuse. We’d recommend starting with mushroom croquettes which have a silky luxurious filling, accompanied by a perfectly balanced saffron aioli. 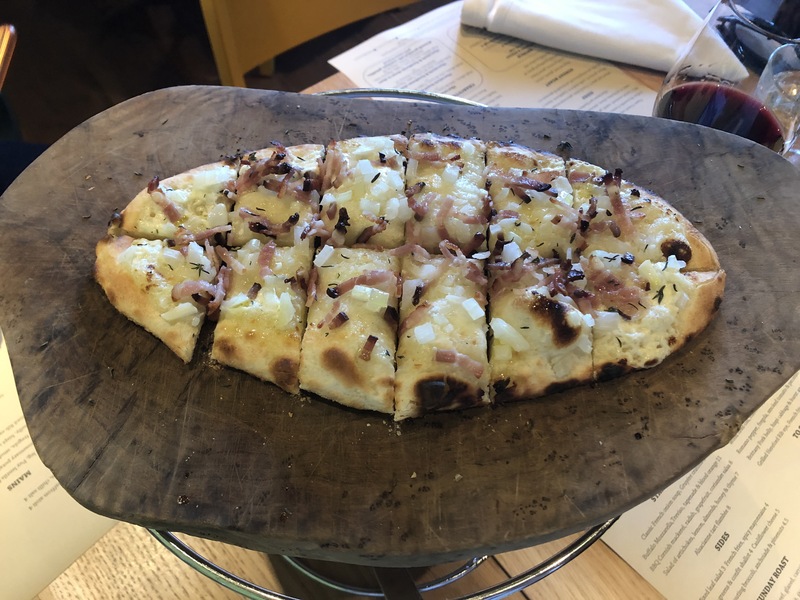 The Alsacianne tart flambée sounds exotic, but really it’s just a freshly baked cheesy pizza style bread which is perfect for sharing. The BBC Cornish mackerel was absolutely stunning to look at, with quite a mild flavour in contrast to the punchy radish and grapefruit which accompanied it. And then of course, the piece de resistance. Galvin HOP has ensured that the humble Sunday roast has been pimped up to epic posh-pub-grub proportions. As a Northerner, I was hugely impressed by the size of the Yorkshire pudding and how well they were cooked! The only roast offered is the beef roast (the best kind of course) and I savoured every mouthful of the saliva inducing hunks of tender, juicy meat which came alive when doused in mouthwateringly rich delicious gravy. Glazed carrots, fluffy potatoes with crispy coats and fresh al dente green beans completed this perfect plate. And of course on the side, there should always be a piping hot dish of cauliflower topped with lashings of buttery, creamy, diet-starts-tomorrow, cheese. With copper tanks above the bar sporting unpasteurised Pilsner Urquell which is flown in fresh every week, the men on our table took full advantage of this, while the ladies supped on a beautiful selection of wines by the glass. 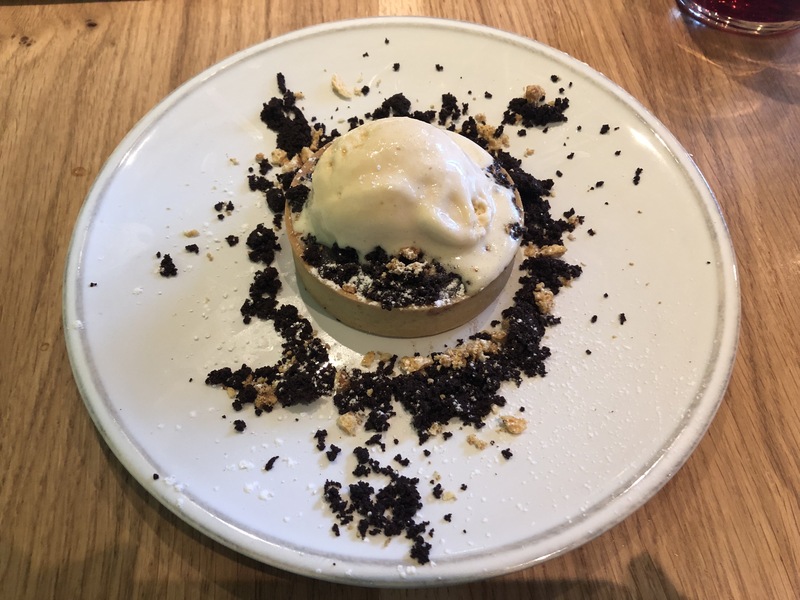 Desserts range from blood orange cheesecake to the warm chocolate tart with baileys ice cream – guaranteed to slump you into a self-inflicted food coma! Luckily a double shot of espresso will get you home! 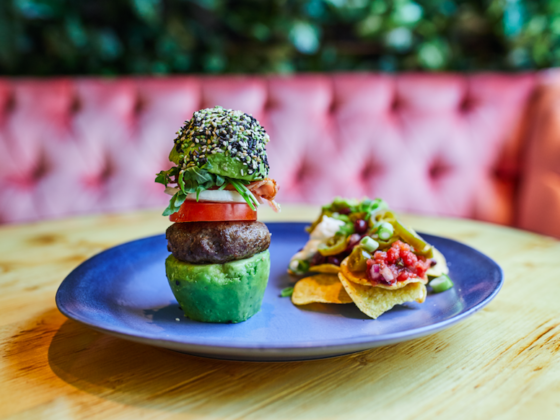 Styling out Sundays, the Galvin HOP roast is super impressive, so forget cooking at home and all the washing up, and get yourself booked in for an end-of-the-week reward. It’s a real treat. Galvin HOP also offers a range of mains on Sundays as well as a special brunch menu and selection of charcuterie boards.